DESIGN : Compact and Ergonomic Design at only 5-5/16"
INNOVATION : Assist Mode (A-mode) feature helps eliminate "screw cam-out" and "cross threading"
Do more with less. 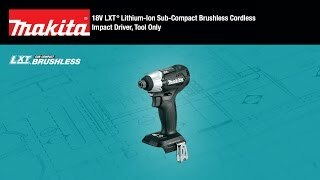 The Makita 18-Volt LXT® Lithium-Ion Sub-Compact Brushless Cordless Impact Driver (model XDT15ZB, tool only, battery sold separately) is a fastening solution with significantly less weight. The 18V Sub-Compact Impact Driver is part of a new class of compact, with the size and weight of lower voltage tools but with the performance, power and compatibility of 18-Volt. 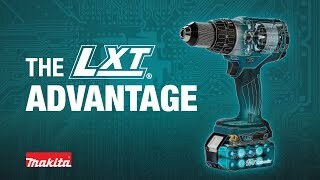 The expansive breadth-of-line of the Makita 18-Volt LXT® Series means an 18-Volt battery from any LXT® tool will power the 18-Volt Sub-Compact Impact Driver. The XDT15ZB has an efficient brushless motor with two speed settings and dual L.E.D. lights illuminate the work area. The innovative Assist Mode (A-mode) helps eliminate "screw cam-out" and "cross threading" by driving at low speed until tightening begins, and is ideal for driving longer fasteners. At only 5-5/16 in. and 2.6 lbs. (with battery, sold separately) it is a fastening solution with superior comfort and handling. Compact and Ergonomic Design at only 5-5/16"
Net Weight (with battery) : 2.6 lbs. Shipping Weight : 2.64 lbs.